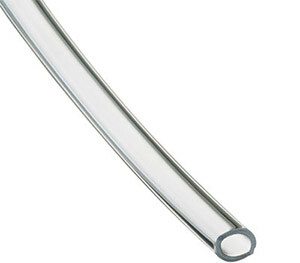 Vinyl tubing is clear and flexible and provides an economical means of fluid transfer in a variety of applications. Intermittent exposure to hydrocarbons, such as gasoline, kerosene, diesel fuel, etc., will cause premature hardening and failure of vinyl tubing. Specifications shown are typical and are meant only as a guide. Field testing is recommended to find the actual values in the given application. Notes: The listed working pressures are based on short term burst using a 4-to-1 safety factor. 118 for 1 1/8 in. 138 for 1 3/8 in. 158 for 1 5/8 in. 114 for 1 1/4 in. 134 for 1 3/4 in. 112 for 1 1/2 in. 238 for 2 3/8 in. 214 for 2 1/4 in. 234 for 2 3/4 in. 212 for 2 1/2 in. 312 for 3 1/2 in. 434 for 4 3/4 in.